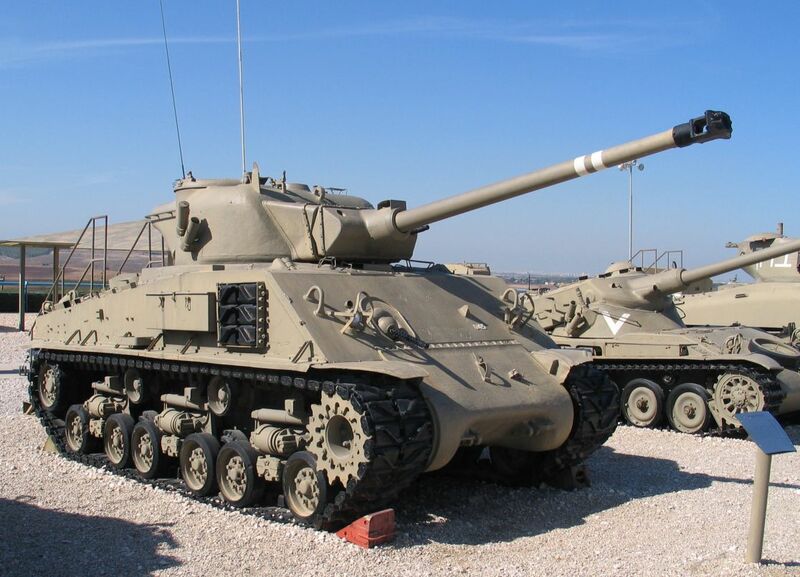 Was the Israeli Super-Sherman, as used in the Sixties and early Seventies, the same as the Sherman-Firefly? Last edited by 32Bravo; 03-01-2008 at 05:45 PM. Israeli ingenuity - a case of mend and make do? Or, as Clint would say 'Improvise, adapt, overcome!" Looking back over the yawning chasm of thirty five years, I seem to recall reading one report at the time, that both the Supersherman and the Centurion had an advantage over the Syrian T54/55's, in the Golan, on account of the greater angle of elevation and depression of their main armament. THe report stated that the Soviet built tanks, being designed to fight on the plains of Europe were out-matched because of this or, at least, it was one of the reasons. I have more in my personal resources, but it will take time to dig it all up. Here is some quick information that I was able to gather (I've been busy this weekend). I will try to post more through the week. I'm not sure that the quotes below are completely accurate, but hopefully it can be checked against other sources that I plan to post later. The first Sherman tanks were bought during the 1948 War of Independence, from an Italian junkyard where they were being sold as scrap metal. The IDF eventually bought 35 of these, but only 14 were operational by the end of the war. Since these tanks had sabotaged guns, some were re-gunned with the Krup 75mm field gun. During the early 1950s, more M4s were purchased from various sources, and the Sherman became the standard tank in Israeli armored units. In collaboration with France, the tanks were re-gunned with the M50 75mm gun (M-50) and, later, with a 105mm gun (M-51). Some "Super Sherman" tanks, armed with a 76.2mm (M-1) gun were also purchased. The Sherman saw action in the 1956 "Kadesh" operation in the Sinai Peninsula, against the Egyptian army (who employed its own version of the M-4, re-turreted with AMX-13 turret). In Six Day War (1967), Sherman brigades were still the mainstay of the Israeli armored forces, though more modern MBTs were in service at the time. In the Yom Kippur War (1973), Sherman tanks fought, as always, in the front lines. Fighting against Syrian and Egyptian T-55 and T-62 MBTs with a WW2 vintage weapon, the Sherman crewmen embodied the motto of the IDF's armor corps: "Man is the steel". No other vehicle in IDF use was modified and had so many variants based upon as the Sherman. Besides its use as a tank, there were engineer variants, mine plows, rescue vehicles, live fire moving targets, self propelled guns, mortars and MLRs, ambulance and many more. The M-50/155 Howizter is another conversion of the M-4 Sherman. The M-50 155mm is an Israeli indigenous self propelled gun - a French 155mm howitzer was fitted on a Sherman chassis. In the 1950’s French policy towards Israel underwent a major change. France agreed in to provide Israel with around 250 Sherman Tanks (Super Sherman’s). These were mainly M4A1 tanks, with 76.2mm M1 guns, and HVSS. The tanks were transferred to Israel in a clandestine operation lasting for several weeks. These tanks arrived directly to beaches in Israel in 1953-1954. They arrived just in time to fight in the Sinai Campaign (1956). When the Sinai Campaign (1956) war broke out, Israel had 180 Sherman tanks ready for battle of total 205 Sherman tanks. The M-50 was designed with the CN 75-50 gun to defeat T-34 and T-85 tanks, with appearance of T-54 and T-55 Israel needed a new gun and as on M-50 Israel used a French gun, the new 105mm CN 105 F1 gun. This gun was a 56 caliber and 6m long, firing a HEAT round with a 1000 m/sec velocity. However, this gun could not be installed in a Sherman turret, as this offered not enough recoil space. Israel then came up with a solution of their own: By shortening the gun to a 44 caliber gun (about 1.4 meters shorter) and accepting a lower muzzle velocity of around 800 m/sec. this modification, called the CN 105 D1 gun, could indeed be crammed into a T23 turret. This gun was fitted in M4A1 tanks with HVSS, 180 M-51 tanks were ready in late 1960's. The M-51 Sherman tank developed with French-Israeli collaboration of the basis of the US Sherman tank, mounted a long 105 mm gun. The tank also had installed a US diesel engine and wide track and suspension. The tank participated in combat during the Six Day War (1967). The M-51 was a key participant in the famous battle in the Dotan Valley, as well as in the Yom Kippur War (1973). When the Six Day War (1967) war broke out, Israel had 515 Sherman tanks ready for battle out of a total of 520 Shermans, and when the Yom Kippur War (1973) war broke out, Israel had 340 Shermans. In the mid to late 70s, Israel had supplied over 150 M-51 Sherman tanks to the Chilean army. on morning of 13 October 1973 near Tel Shaar on the Golan Heights. And who has prepeared that report? Indeed neither Centurion ( depend of what modification) nor the ancient ww2 raritet Sherman ( super/mega and ets) HAD NO any advantage of the T-54/54 ( the next generation post-war tank). The both was the British modification. During the all side tests with analogical soviet tanks T-62/64 ( basis soviet for that period) it was established. - the tank had the worsen system stabilization then the T-62. - the speed and maneuvereability of the Centurion could not be even comapred with T-54/62. The more interesting was the Centurion Mk3, modernized in Israel. The soviet got it in the 1973. The Israel tank had more powerfull engine of american M60A1, better optic and electronic. But....it was established that the Israel shells for 105 mm gun have much less reliability and accuracy then Original British ones. При огневых испытаниях из танковой пушки по целям, расположенным на дальностях 1400-2400 м для БПС и 1100-2200 м для бронебойно-фугасного снаряда, затраты времени до первого попадания в цель соответственно составили 112 и 123 с, что было значительно выше, чем у отечественных танков. При испытаниях выявлено, что боеприпасы израильского производства, которые находились в танках вместе с английскими, обладали низкой надежностью. Так, 28% из числа израсходованных подкалиберных снарядов израильского производства имели высокое отклонение от траектории полета и не долетали до цели. Аналогичные результаты были получены на отдельных выстрелах кумулятивными снарядами, также израильского производства. При стрельбе на дальности 2000 м у 7% израильских бронебойно-фугасных снарядов (типа L35A2) взрыватели не срабатывали при попадании в грунт. При стрельбе на дальность в 1000 м таких отказов было уже 54%. Как было выяснено, БПС L28A1 пробивал 80 мм монолитной брони средней твердости, установленной под углом 68 град. на дальности в 2000 м (у танка Т-54 бронирование лба корпуса составляло 100 мм при тех же углах и лба башни 200 мм). Бронебойно-фугасный снаряд L35A2 и его израильский аналог при попадании в монолитную броню толщиной 80 мм, установленной под углом 60 град., давал отколы на тыльной поверхности брони в форме диска диаметром до 200 мм и толщиной до 20 мм, которым наносились поражения внутри танка как вторичным снарядом. Разнесенные и комбинированные преграды танков Т-64 и Т-72 бронебойно-фугасным снарядом не поражались. Были отмечены низкие осколочные действия бронебойно-фугасных снарядов при попадании в грунт. . The time of aiming of Centurion gun was twice higher than the soviet ones.The armor penetration ability of L28A1 was roughtely 80 mm on disctance 2000m . The front armor of the T-54 was 100/200 mm. The armor-piercing shell L35A2 could not penetrate frontal armor of T-62/72 at all. SO be carefull guys to take the Isreal propogandic posters as the "reports"
I am sure that hte Arabs had the same propogand. As I said, Chevan, the past theirty-five years are as a yawning chasm, into which many of my memories fall. I certainly didn't have access to any Iraeli reports. One of the characteristics of british Army training is that they have a policy of instilling as much knowledge as is available of the equipment and tactics of their potential enemies. Not all of us are stupid and of limited intelligence. If you believe it to be propaganda, or perhaps a figment of my aging imagination, then show me, don't just accuse. Do you not think that the Israeli sucesses have to speak for something, or are you saying that it was NATO forces that won the battles, and that the rest was just Israeli posters? My original enquiry was regarding the, reported, tactical advantage of the Israeli tanks over those of the Syrians, in the Golan Heights, on account of the angle of elevation and depression of their main armament. Have you anything to say about this? By the way - how's the election going in Moscow? Last edited by 32Bravo; 03-03-2008 at 04:22 AM. Thats' certainly true, not all of posters are the propoganda. However it was a war, and as in any war - thee was the battles not just in battlefilads, but in the informational/propogandic fields too. Just simple informational war, the arabs made the same things. As i said , the tests of the captured Isreli tanks did not showed any adventage over soviets. Besides as it was established the original British tank and ammunition was better then Israeli modernized. They actually partly improved its Centurions, via the established the Americans engines from M60A1. But in sense - it have not created the NEw Super Tanks. I do know nothing any more, coz i do not go to the election . Yes, but neither side posted them on the walls of the Lower Falls. Nonesense! The Arabs caught the Israelis with their pants down, thus not only proving their ability to plan, but also their strategic awareness (I don't make assumptions on peoples' intelligence according to their race). As an exampe of Arab ingenuity: the Israelis never considered the solution to breaking through the sand-berms which lined the Suez Canal, but a young Egyptian Lieutenant of engineers came up with it in no time at all. If Sadat had not interfered and over-ruled his general staff regarding the strategy in the Sinai (he did this to help relieve the pressure on the Syrians) the Israelis might never have beaten the Egyptians in the way they did. There were also captured T54/55's which were handed over to a British team that also inspected the battlefieds - I'm afraid I have to differ. There are tests and there are tests. Were there tests carried out on the main armament to discover whether there was any tactical advantage in the way I described? Perhaps not...or perhaps better not to mention it? I asked one simple question and I do not have an answer, as yet. If one wants to look at the situation scientifically - what was the attrition rate of Arab to Israeli tanks? Is war a science or an art or a mixture of both? I thought that you might not go as you are in the Ukraine and not in Russa? Last edited by 32Bravo; 03-03-2008 at 07:13 AM. I have more on the Israeli Centurion as well, but I'm at work right now. I can post more later when I have access to my sources. But for now let me say that the Israelis modified the Centurion quite extensively including more reliable American diesel engines. As far as the 105mm L7 gun being able to penetrate the frontal armor of the T-62, let me say that I have been to the Golan Heights several times and have actually examined knocked out T-62 tanks up close. One had clearly been penetrated through the front glacis plate of the hull. I have photos as well. There is the Russian Embassy in Ukraine where voting took place among the RF's citizens so Ukraine is not the wrong place to hide from Russian elections and elections on the whole. The only place without elections was Afganistan a few years ago but Americans spoilt everything. So there is no place to hide from democracy today. Last edited by Kato; 03-03-2008 at 07:47 AM. I think that what I had meant to say was that I thought that Chevan had not taken part as the election was for a Russian president and prime minister, and not a Ukraine president and prime minister, believing Chevan to be a citizen of the Ukraine. As for the rest of your post regarding democracy: I am pleasantly surprised to see that you have a sense of humour - there is hope for the world yet.